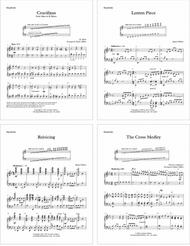 Original classical style composition. A challenging but accessible title. A really neat malleted middle section. For 5 octaves advanced level. The title reflects both the style and form of the composition. Popular title and top seller. For 2 octaves. 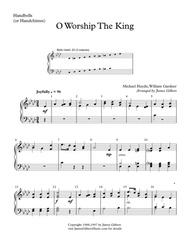 Originally written for a senior adult choir as a teaching aid for learning plucking and tolling techniques. A short and catchy piece. Good for children and senior groups as well as a good plucking and tolling review piece. (Level 2). 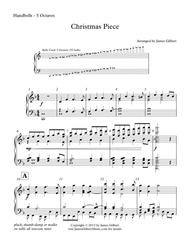 A version for Easy Piano is available in the collection Easy Piano Selections, available in this catalog. Popular Title A highly syncopated piece. 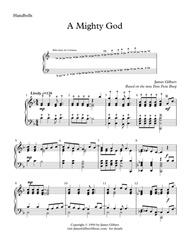 Based on the familiar hymn A Mighty Fortress Is Our God (EIN FESTE BURG). (Level 4+ to 6-). 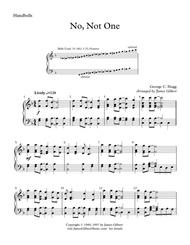 A similar title for Solo Piano is available in the catalog. For 5 Octave Handbell Choir. 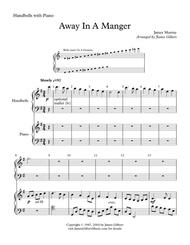 An arrangement of the hymn tune HERZLIEBSTER JESU by Johann Cruger. 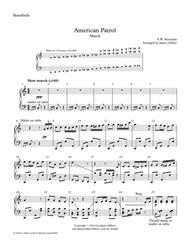 Arrangement for 5 octave handbells of this classic American piece. For 3 Octaves handbells with piano. Written for a small beginning youth group. The traditional (American) tune (MUELLER) with some nice harmonies. You may also want to try this with handchimes. (Level 2). For 4 Octaves handbells with piano. Adapted from the 3-octave version. Adds some mart, mallet, echo and similar techniques. The traditional (American) tune (MUELLER) with some nice harmonies. You may also want to try this with handchimes. (Level 2+). For 3-Octave handbells. A setting for handbells of the popular praise chorus. 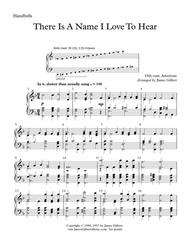 The biggest (and only) challenges with this piece is getting the rhythm right at the speed required as well as the unusual use of accidentals. If anyone wants to know why I left it in C major instead of a key signature of F minor, drop me a note. Christmas and Advent Selections for Handbells. A collection of titles appropriate for Christmas and Advent. 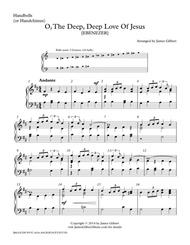 Titles include Away In A Manger (4 Octaves with piano); Christmas Medley (5 Octaves); Christmas Piece (5 Octaves); from Exultate Deo by Alessandro Scarlatti (3 Octaves or small ensemble); Joy to the World (3 Octaves with some optional bass 5th octave notes). 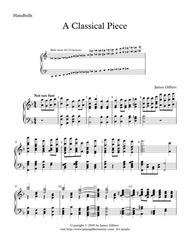 These piece are arranged or composed by James Gilbert. These pieces have all been used by church handbell choirs and were well received. All the titles (except Exultate Deo) were recorded by different combinations of instruments and featured on the album A New Old Christmas. For your Advent or Christmas use. 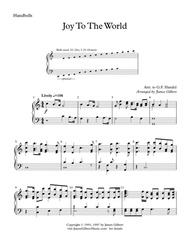 Medley includes: O Come O Come Emmanuel; The First Nowell; O Little Town of Bethlehem; Joy To The World. Featured on our album Sacred Favorites for Solo Organ. 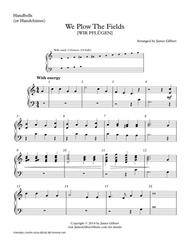 Different settings of this arrangement are available for Organ or Orchestra. A festive contemporary setting of some familiar Advent and Christmas pieces. For 5 Octaves (53 bells). An Instrumental version of this title was featured on our Christmas Album A New Old Christmas. 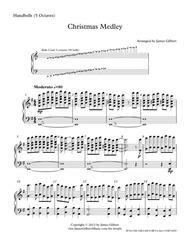 A similar setting for Orchestra or Organ or easy piano are also available in the catalog. A good setting of this title with a few twists. For 3 or 5 Octaves. Not too difficult. A setting of this title for Orchestra and 5 Oct Handbells is also available. (Level 5 for rhythm 4 or 5 for other elements). Popular title and top seller. A serene piece with a pulsating malleted bass line. Also very effective with handchimes ringing all parts. (Level 3). Contains some optional 5th octave notes (C3-B3). An original composition for 5 octaves. This piece is mostly block chords with minimal bell changes. Also available for trumpet trio. Easter and Lent Selections for Handbells. 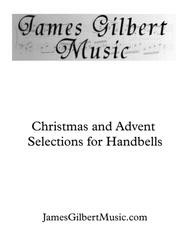 A collection of arrangements and compositions for handbells by James Gilbert. These are for intermediate level groups. 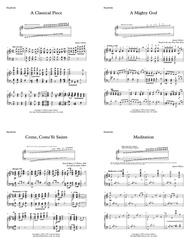 Titles are: Crucifixus from Mass in B Minor (Bach) (3 Octaves with optional 5th octave bass notes); Lenten Piece (5 Octaves); Rejoicing (5 Octaves); The Cross Medley (5 Octaves); The Head That Once Was Crowned (5 Octaves). 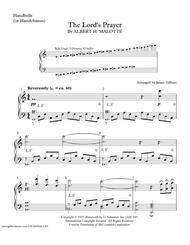 These titles are suitable for an intermediate or advanced 5-octave choir. 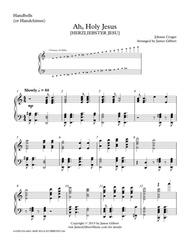 Crucifixus sounds very good when played on handchimes with the simple modifications listed in the music. 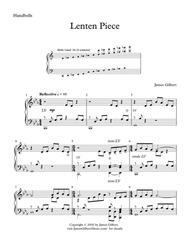 Lenten Piece is a very reflective, almost new age piece in a minor key. If you listen very carefully you might be reminded of Kum Ba Yah (it's hidden in the piece). 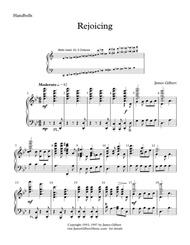 Rejoicing is a dance-like piece with a Renaissance, modal feel. 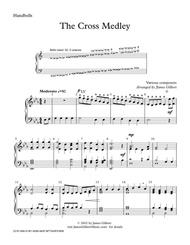 The Cross Medley is a nice selection of titles that all have the word cross in their titles. Those include Jesus Keep Me Near The Cross, The Old Rugged Cross, When I Survey The Wondrous Cross and more. A portion of Scarlatti's Exultate Deo. Written for a quartet of advanced players but works quite well with a full size group. (Level 4). Free download! For use with accompanying congregational singing. One verse of the hymn. Range D3-Eb7. (Level 2+) Free download. 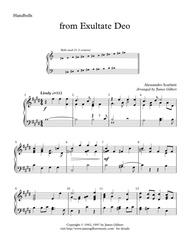 The traditional Christmas piece attributed to Handel. 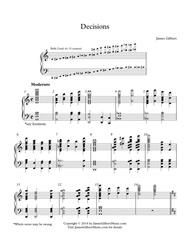 Although written as a stand alone piece it works quite effectively as an introduction to and accompaniment of congregational singing. (Level 3). Other settings of this title are available for Orchestra and Organ (as part of a medley). Hymn tune: ANTIOCH. A slow reflective piece inspired by the folk tune Kum Ba Yah but sounding little like it. (Level 4+). Good to use at other times of the year besides Lent. A meditative original composition. (Level 3). Can also be used with handchimes. For 5 octaves but also playable by a 3 octave group. A lively adaptation of this hymn with some notable syncopation. (Level 4+). For 3 octaves with some optional 5th octave notes. Hymn tune: HARPER MEMORIAL. 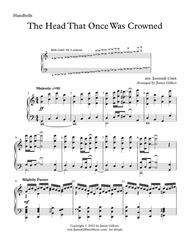 A 3 octave arrangement of this familiar hymn tune. 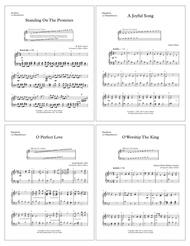 For beginning groups to use as a solo or even as accompaniment to singing of the tune. Level 2. A setting of this title for solo organ is also available. A relatively simple setting of this traditional hymn. Written for a senior adult group. (Level 2+). Hymn tune: LYONS. A full arrangement for 2 octave handbell choir. 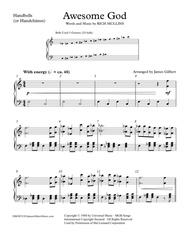 See our handchime category for a different setting of this tune for beginning groups. Popular title. This piece is in a lilting 6/8 almost dance feel. Plucking malleting and some challenging sections for C3-C4. (Level 5+-). 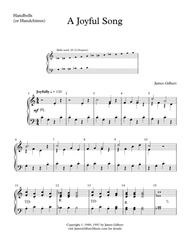 A setting for Solo Piano is also available in the catalog. Sacred Selections for Handbells. 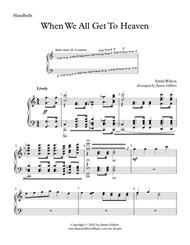 Titles in this collection are: A Classical Piece; A Mighty God; Come, Come Ye Saints; Meditation; No, Not One; There Is A Name I Love To Hear; When We All Get To Heaven. 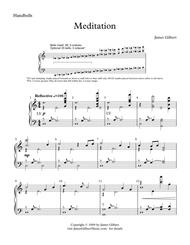 Although all titles are written for 5-octave groups, Come, Come Ye Saints and Meditation can be played by 3-octaves. No, Not One is for 5-octave groups but only requires 40 bells. Also playable by 3-octave choirs. 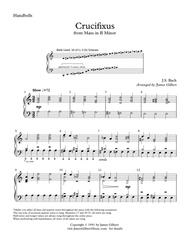 There Is A Name is a 3-octave piece with optional 5th octave bells in the bass. A Classical Piece is based on the orchestra composition. A Mighty God is a modern interpretation loosely based on A Mighty Fortress Is Our God. 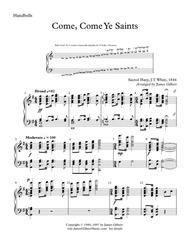 Come, Come Ye Saints was adapted from a similar arrangement written for handbells and orchestra. Meditation is a good piece to explore your 'let vibrate' and dampening techniques. No, Not One is based on the traditional gospel hymn, but with a fair amount of syncopation. There Is A Name is a slow, meditative setting of the popular hymn that is typically sung faster than this arrangement. Standing on the Promises, a collection of sacred title for 2 & 3 Octave handbell choirs. (These titles can also be used with handchimes). Titles include: Standing On The Promises (3 octaves); A Joyful Song (2 octaves, G4-G6, Middle C = C5); O Perfect Love (3 Octaves); O Worship The King (3 octaves, C4-E6); My Jesus, I Love Thee (2 Octaves, C4-C6); O, The Deep, Deep Love Of Jesus (2 Octaves C4-C6); We Plow The Fields (2 Octaves, C4-C6). A challenging and fun piece. Contains extensive plucking and mallet sections. (Level 4). 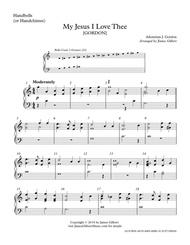 A medley of familiar hymns related to the cross. (Level 3-4). 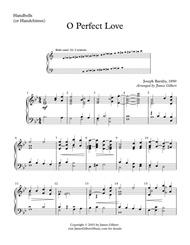 Additional settings of this title are available for Orchestra and solo Organ. An arrangement of this Easter tune. Don't let the 16th notes in the sample scare you - they don't last for long. A nice festive piece with a slow minor middle section. A setting of this title is available for Organ. Hymn tune: ST MAGNUS. For 5-Octave handbells. An arrangement of what is probably the most popular setting of The Lord's Prayer. Arranged here for 5-octave handbells. Techniques used include, shake, LV and tempo changes. A reflective version of this piece in 6/4. Also known as O How I Love Jesus. Slower than often sung. It has been reported that this works very well with handchimes. (Level 3). An arrangement for 2 octaves of this hymn tune. An upbeat fun setting of this classic gospel hymn. (Level 3-4). A similar setting of this piece can be found for solo Organ.